Many years ago, I laced up my first pair of hockey skates at the old Eastridge Ice Arena in San Jose. My family wanted to get out of the summer heat, and as a result, the mall became our go-to place to escape. The ice hockey career was short lived, but my love for the Bay Area never went away. I'm honored to be sharing the stories that matter most to our community, and even more thrilled to be doing it in a place I've long considered my second home. As the first-born son of Vietnamese American immigrants, I was raised in Western Washington, but spent a lot of time with relatives down in the South Bay. I'm a proud graduate of the University of Washington, where I studied communication and political science. With that said, I hope you'll forgive me in advance for my allegiance to the Seattle Seahawks. Whether it's meeting with Super Bowl MVP's or everyday superstars, I love connecting with people from all walks of life. On a professional note, I got my first on-air break as an anchor/reporter at WAND-TV (NBC) in Central Illinois. From there, it was back to my home state where I served the viewers of the Inland Northwest as an anchor/reporter for KREM-TV (CBS). Prior to joining the ABC7 News team, I worked as a weekend morning anchor and general assignment reporter at KXTV, the ABC affiliate in Sacramento. My family and friends mean the world to me, and I'm grateful that they've been supportive of my career throughout the years. Outside of the newsroom, I enjoy trying out new restaurants, and as a result, can often be found at the gym burning off those extra calories! I've completed a handful of half marathons, and have my sights set on completing a full course in the near future. Let's stay connected on Twitter or Facebook. I'd love to get your feedback, and look forward to seeing you the next time I'm in your neighborhood! 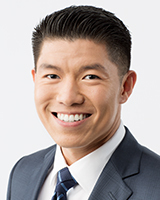 Chris reports weekdays from the ABC7 South Bay bureau, and anchors ABC7 Morning News on Saturdays. GRANDMOTHER CHARGED: Authorities say she murdered the child by "manual strangulation."